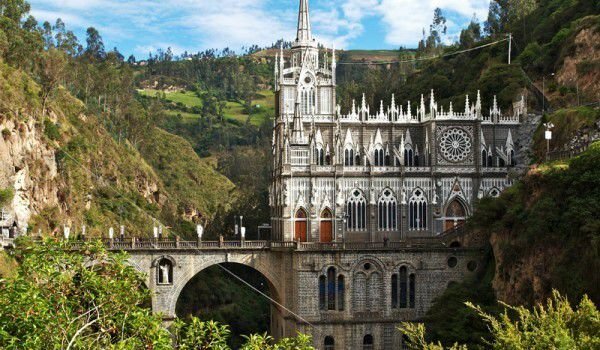 Las Lajas Cathedral is one of the most valuable treasures of Colombia. This temple is amazingly beautiful, as if out of a fairy tale. It is situated among the remote mountains of southwestern Colombia and is considered one of the most brilliant pilgrimage shrines in the world. Las Lajas Cathedral was built in an incredibly picturesque region - firmly clings to a rock wall and just below it run the river waters of Guaitara. Two up to 100 m waterfalls complement the fabulous views of the gorge, where the Las Lajas Cathedral is. Canyon River Guaitara was formed in the southern part of Latin America and has become home to one of the most beautiful cathedrals in the world. A beautiful legend associated with the temple, is told by local people. According to legend, back in 1754 a woman named Maria Meneses walked through the area near her home in the nearby town of Ipiales. The road was long and one day the woman was hit by a severe storm. The only shelter that Maria was able to find was a cave in the rocks above the river Guaitara. The woman spent her whole stay in prayer. An image of Mary appeared in consequence. It is now known as the Virgin of Santisima. Over time, the rock face and the miracle had become a place renowned for its healing action and the creation of a whole line of wonders. Today, this image of the Virgin Mary is located on a 45 m high rock, which can be seen on the back of the Las Lajas Cathedral. The construction of the fabulous Las Lajas starts at the beginning of last century. The foundations of the temple were laid in 1916 and finally Las Lajas was completed in 1944. The official dedication of the temple was on August 20, 1949. This temple recreates in an incredible way the Gothic architecture styles, and construction. Las Lajas Cathedral is designed so that the image of the Virgin Mary is visible form its highest altar. Las Lajas Cathedral was built entirely with donations from local people, was erected at the site of a small wooden chapel, which was situated on the cliffs in the 19th century. Today the Las Lajas Cathedral is a place for pilgrimages by many pilgrims from both Colombia and in Ecuador. Easiest way to the fabulously beautiful temple is by taxi from the station into the near by city of Ipiales. Do not miss the opportunity to stop on the high cliff and look at Las Lajas, which stands magnetically down the canyon of the river.